An early 20th century cut glass vase with silver plated stand. The cutting of the vase is of particularly high quality with very difficult cuts such as the bowls, medallions and wreaths. The rim is cut and there are fine diamond cuts around the rim area. To the base the pontil has been ground and polished with radial petal cuts outside this. The stand is the original and has four cast decorative feet. There are no makers marks to the glass nor the base, but I suspect the glass is likely Waterford from the cutting and quality. A superb item of glass cutting skill. Wear to the base of the glass where it sits in the stand. A few minor chips and nibbles to the rim, but nothing serious. Normal wear and aging to the metal stand with patina in the crevices. The plating seems largely in tact with small areas of wear. If for any reason you are unhappy with your item please let us know as soon as possible, and we will do our best to put things right. 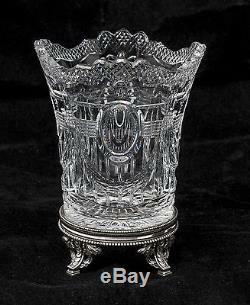 The item "Antique Edwardian Fine Quality Cut Glass Swag & Bow Vase & Silver Plated Stand" is in sale since Wednesday, March 29, 2017. This item is in the category "Antiques\Periods/Styles\Art Nouveau". The seller is "chrisbuckman" and is located in Lincoln. This item can be shipped to United Kingdom, Austria, Belgium, Bulgaria, Croatia, Cyprus, Czech republic, Denmark, Estonia, Finland, France, Germany, Greece, Hungary, Ireland, Italy, Latvia, Lithuania, Luxembourg, Malta, Netherlands, Poland, Portugal, Romania, Slovakia, Slovenia, Spain, Sweden, Australia, United States, Canada, Brazil, Japan, New Zealand, China, Israel, Hong Kong, Norway, Indonesia, Malaysia, Mexico, Singapore, South Korea, Switzerland, Thailand, Saudi arabia, South africa, United arab emirates, Ukraine, Chile.